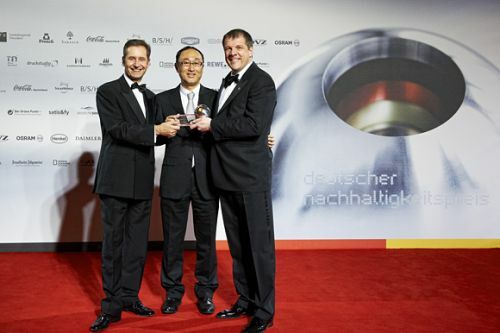 Seen at the ceremonial presentation of the German Sustainability Award for 2011 (from the left): Vaillant’s Managing Director Dr. Carsten Stelzer, Yuishi Fukuda, President of Honda Deutschland GmbH, and Dr. Carsten Voigtländer, Chairman of Board the Vaillant Group. The ecoPOWER 1.0 micro-cogeneration system developed by Honda and the heating technology specialist Vaillant convinced the prestigious jury of the German Sustainability Award. The expert committee singled out for top place Europe’s first micro-cogeneration system for detached houses in the category of “Germany’s most sustainable products/services”. This eco-friendly, ultra-efficient technology is used to produce electricity and heat simultaneously. Since Honda in 1972 became the world’s first automaker to meet the USA’s tough exhaust gas standards, with the CVCC engine, we have been working purposefully to optimize our ecological footprint. In order to render these efforts quantifiable, we announced in June that by 2020 we will have reduced the CO2 emissions by 30 per cent in all product categories. The ecoPOWER 1.0 can also contribute towards significantly downsizing resource consumption and CO2 emissions”, said Yuishi Fukuda, President of Honda Deutschland GmbH. “The jury’s decision makes it clear how significant decentralized cogeneration is for Germany’s future energy supply”, added Dr. Carsten Voigtländer, Chairman of the Board of the Vaillant Group. With the ecoPOWER 1.0, Europe’s first micro-cogeneration system for use in detached houses is available – and enabling purchaser for the first time to have access to this environmental friendly. Whereas during power generation in conventional power plants more than half the energy involved is lost as waste heat without being used, this family-sized power plant produces heat and electricity simultaneously on the spot at highest efficiency and with minimized environmental impact. This not only reduces heating and electricity costs, but also enables CO2 savings of up to 50 per cent under optimum conditions. The technology can be installed in both new houses and existing homes. Besides the cogeneration unit from Honda , the heat decoupling unit , the complete system comprises a 300-litre multi-functional storage tank, a wall-mounted gas condensing boiler for peak loads and the control system. The rating of the peak-load heater can be varied, and will depend on the heat requirement of the property in question. The two development partners each contributed to the alliance their specific expertise accumulated over the years. Vaillant developed the entire hydraulics of the heating systems, the control technology and the necessary connections. For controlling the entire system, the heating technology specialist designed a controller that ensures economical, demand-driven energy utilization. As one of the world’s leading companies in the fields of environmental engineering and engine technology, Honda is for the first time using a new kind of engine technology, known as the EXlink (Extended Expansion Linkage Engine). Thanks to this innovation, with significantly reduced overall dimensions, an enhanced efficiency level of 92 per cent has been achieved. In Japan and the USA, Honda has since 2003 been offering micro-cogeneration-plant modules for use in detached houses. So far, more than 100,000 systems have been sold and installed . Honda is utilizing its production expertise for series manufacture of the equipment involved since years. Vaillant ranks among Europe’s market in the cogeneration sector amongst the leaders due to its wider product offerings. The German Sustainability Award is an accolade for companies, products and brands that have proved exemplary role models in marrying commercial success to social responsibility and reduced environmental impact, thus rendering particular service towards creating a viable society for the planet’s future. The focus here is on stringent sustainability management and sustainability issues in brand management. The aim of the award is to encourage companies to proactively progress sustainability and to anchor the principles of sustainable development more securely in public awareness. The accolade is an initiative of the German Sustainability Award Foundation (Stiftung Deutscher Nachhaltigkeitspreis e.V.) in conjunction with the German federal government, the German Council for Sustainable Development, business confederations, civil-society organizations and research institutions. Mitsubishi iMiev et Lexus CT200H sont les 'Clean Car of the Year'! BMW Group Innovation Days 2010 - Why electromobility? Mitsubishi Motors' i-MiEV awarded with the "Environment Special Grand Prize"
GM First Major Automaker to Manufacture an Advanced Lithium-Ion Battery Pack in U.S.